Spot truckload freight activity increased sharply during the first full week of 2016, as rates also improved or held steady – while a separate report shows December was better than the month before. 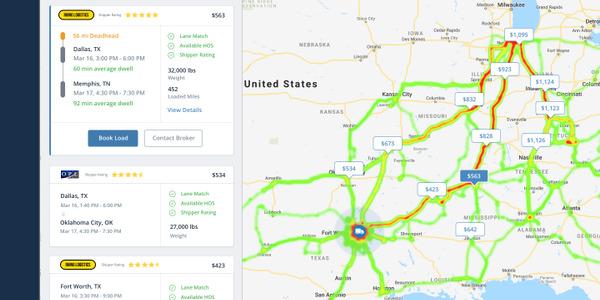 According to the freight matching service provider DAT Solutions, which operates the DAT network of load boards, despite a 2-cent decline in the average fuel surcharge, national average rates rose for vans and reefers last week while flatbed rates were unchanged. In the spot van market, load posts increased 28% while truck posts jumped 58% in the first full workweek of 2016. 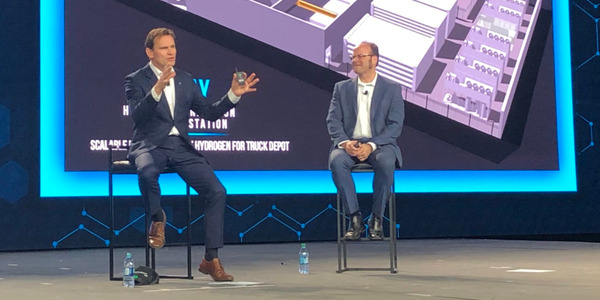 As a result, the van load-to-truck ratio dropped 19%, meaning there were 2.7 van loads for every truck posted on the DAT network, a strong performance for early January, according to the company. 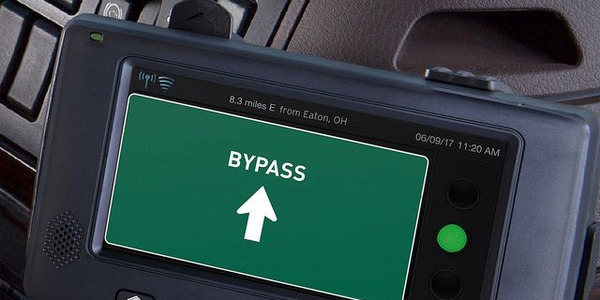 The national average van rate rose 1.2% to $1.73 per mile, although rates fell on high-volume lanes originating in the Northeast, Midwest, and on the West Coast. All reported rates include fuel surcharges. Reefer load posts rose 6% and truck posts surged 51% during the week as the national average reefer rate gained 0.5% to $1.96 per mile. Compared to the shortened New Year’s holiday week, the load-to-truck ratio dipped 30% from 9.6 to 6.7. 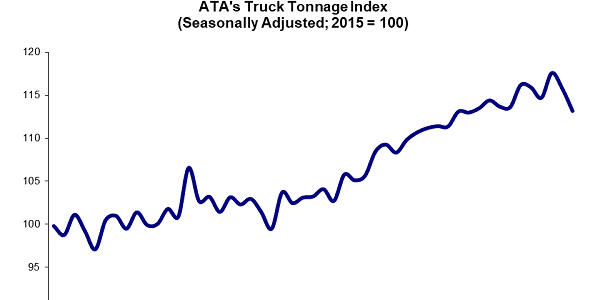 Flatbed load posts jumped 61% and truck posts were up 74%. The flatbed load-to-truck ratio fell 8% as a national average, from 11.4 to 10.5 loads per truck, as the national average flatbed rate held steady at $1.92 per mile. Meantime, newly released figures show spot market freight volume rebounded 15% in December, month-over-month, and truckload line haul rates increased for the three primary trailer types, pushing the DAT North American Freight Index higher from the month before. Compared to the extraordinary volume and rates of 2014, however, spot market indicators continued to lag. By equipment type, van freight availability increased 19%, refrigerated volume rose 13% and flatbed trailers added 7.4%, compared to November. 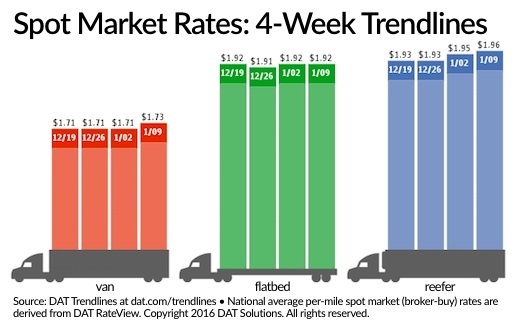 Spot market rates rose 2% for vans, 2.3% for reefers and 1.8% for flatbeds, month-over- month, not including fuel surcharges. 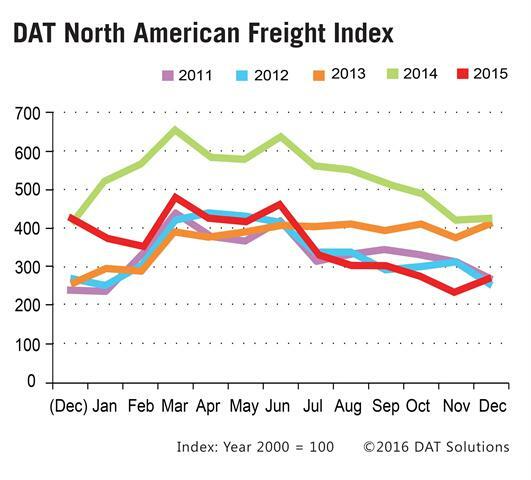 Compared to the record levels of December 2014, overall freight availability declined 37% last month. By equipment type, van demand was down 35%, reefer volume fell 33% and flatbed freight availability lost 47%, compared to November 2014. 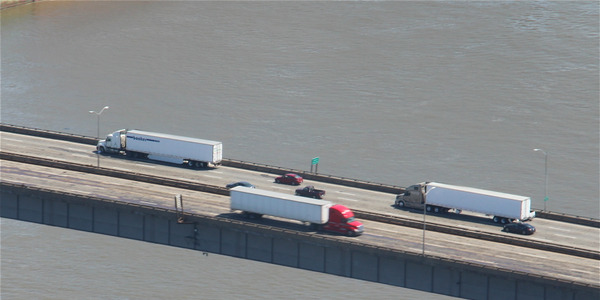 Line haul rates declined 10% for vans, 11% for reefers, and 7.6% for flatbeds, year-over-year. Total rates paid to the carrier dropped by 17%, due to a 50% decline in the fuel surcharge, which comprises a portion of the rate. 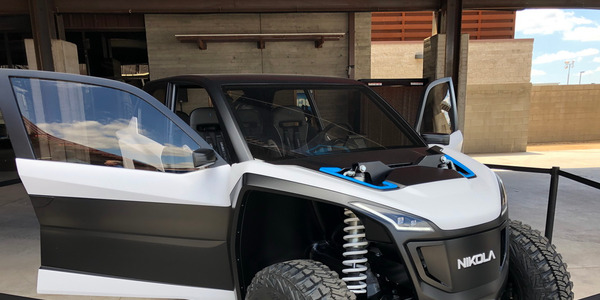 "Trucks were readily available on the spot market in 2015, and at bargain prices, at least when you compare to average rates in 2014, said DAT Analyst Peggy Dorf, in the the DAT blog. "If you take a longer view, however, it's 2014 that looks like the exception. Spot market rates were higher in 2015 than in 2013, the most recent 'normal' year." 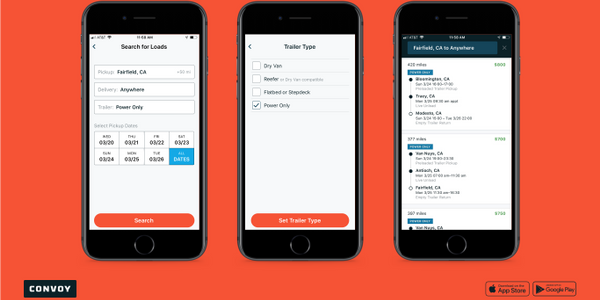 For 2016, assuming that total freight volume is stable or increases modestly, she projects there should be an uptick in spot market van load availability and rates, supporting renewed growth for intermediaries, small to mid-sized for-hire fleets, and owner-operators. 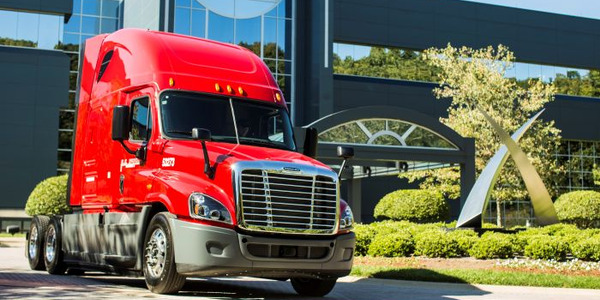 "As first quarter is historically a slow period on the spot market, we can expect the recovery to begin in late spring, barring big, unexpected events that affect transportation," Dorf said.